Social media can be a very effective and helpful thing. It has its dark side of course, but it has also been at times a real blessing by allowing me to stay connected to friends and family who are geographically scattered. But Twitter has also allowed me to connect with a variety of folks, including a colleagues/peers/generally cool folks who I otherwise would not be able to encounter. One of those folks who has been an encouragement to me is Nate Pyle. Nate is a pastor in Fishers, Indiana at Christ’s Community Church (affiliated with the Reformed Church of America). He and I have had lots of great interactions, and he even invited me to guest post on his blog. I was excited when he announced he was being published. 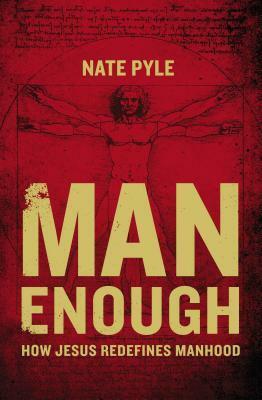 Nate was generous enough to convince Zondervan to send me a free copy of Man Enough: How Jesus Redefines Manhood. This is not the type of book I am usually reading. But now and then I need to move out of my comfort zone and read something a little less cerebral and more “rubber meets the road”. This isn’t to say Nate isn’t a brilliant person and sound theologian (he is), but Nate is writing to take a conversation which has been happening in the ivory towers of more scholarly circles and bring it down to where the Church can access, digest, reflect on, and apply it. For this I am very thankful. What Nate has given us in Man Enough is a deeply personal, authentic, and vulnerable reflection on what it means to be a man. The notion of “biblical manhood” is one which draws antagonisms and visceral reactions from many (myself included). Nate though is a deeply pastoral voice, with incredible ability to discern, cut through the noise (without being combative- a skill I sometimes lack), and leave one feeling encouraged and hopeful that this conversation can be done well. Nate’s central “thesis” is that manhood should not be defined by cultural assumptions of manliness which distort things and apply pressure for males to be macho, tough, strong, stoic, and conform to certain patterns, attitudes, and roles. Instead, manliness is found in becoming like Jesus. Jesus, who allowed himself to be weak, who served, who sacrificed, who was tender and loving becomes the model for men to imitate (of course, the same is true of women). Men and women are therefore not defined by rigidly defined roles, behaviours, and interests, but by their imitation of Jesus, and living into the image of God in which male and female were created. How that plays out may be different for each gender, and also for each cultural context, and even for each individual. The whole book centres around Nate’s own personal struggle, stemming from middle school insecurities. Nate confesses his own battle with trying to be tough, to be accepted as manly, to avoid being perceived as weak. He then unpacks the negative impact it had on his life and relationships- leaving him distant, disconnected, and unable to be honest and real with other people. Nate courageously unpacks a battle many have had. My own story, and I’m sure the stories of many males, has many important overlaps (of course we all have different nuances and experiences, but I’m fairly sure most males can identify with something in Nate’s experience). He describes the freedom which came from dropping the false image with one of his mentor-friends, and how that began a journey of seeing manliness anchored in who Jesus is, not an arbitrary construct of sports, hunting, bread-winning, and emotional toughness. This, Nate says, allowed him to be real, and to be open to be shaped not by cultural demands, but by Christ himself. If I could put my finger on one weakness, it’s this: the chapters (other than chapter 1 which describes the important moment in which he came to his knowledge of the false persona he had built to uphold this sense of manliness) are many different reflections which mostly unpack the same idea. The thought doesn’t develop and lead somewhere. The final chapter is a bit more assertively worded and draws a lot together, but in between, there isn’t a movement towards something. Chapters 3 and 11 struck me as the strongest. But in between there wasn’t much development. To conclude/sum up: Nate Pyle’s is a voice we need in our churches. His pastoral sensitivity and humility is a welcome relief in strong rhetoric and flippant ways we (I include myself here) talk about/to those with whom we disagree. Man Enough effectively brings the conversation to the pews, to cut through the confusion created by the often hostile debates between egalitarians and complementarians. He writes with conviction, but also a definite care and concern for both sides. His voice brings the divided elements closer together to really ask tough questions: are we imitating Jesus, or some cultural constructed definition of gender roles and masculine and feminine attributes. By drawing us to the person of Jesus as the one women and men are both to emulate in our lives, and his effective unpacking of the fruits of the Spirit as characteristics men and women are universally to hold, Nate has lovingly and gently- but also effectively- dismantled the need for false bravado, the muscular, domineering, macho, one-upmanship character demanded by culture from males, which has imposed itself within the Church and distorted our view of masculinity and even our view of Jesus. This book will be liberating to those who have are where Nate was, and encouragement to those who have, like Nate, challenged that place, or felt the pressure to conform to the corrupted vision of manhood. Nate’s call back to the person of Jesus, and to find our worth, value, acceptability, and defining model in him is one which will, if heeded, be of unspeakable value. *The author and publisher arranged for me to receive a free copy of this book. Many thanks to Nate and to Zondervan. This entry was posted in books, Complementarianism, egalitarianism, family, gender, hermeneutics, Jesus, practical theology, Stuff I Like. Bookmark the permalink.